This recording of Bach's great keyboard cycle will be the highlight of the year for Bach fans and especially for the fans of the "high priestess of Bach" Rosalyn Tureck who made her Yellow Label debut with a hugely successful recording of the Goldberg Variations earlier this year. Tureck recorded the "48" in 1952 and 1953 in New York. The recording remained in the catalogue continuously until the 1970s, but has been unavailable since then. This reissue by Deutsche Grammophon includes the complete, essentially unchanged text of Tureck's notes written for the earlier release, containing general information on the "48" as well as specific comments on the Preludes and Fugues. The recording was made at a time when audiences throughout the world were coming to recognize in Tureck the leading Bach exponent of the day. The chief critic of London's The Times, who heard Tureck in recital not long after this recording was made, described her performance as astonishing: "... the audience is held in a spell of silence. Every musical feature of this compendium of keyboard writing is faithfully realized. It is not possible to exaggerate the artistic value of her performance." For Rosalyn Tureck herself this performance of the "48" occupies a seminal position in her development. Says Tureck, who celebrates her 85th birthday in December this year, "My recorded performance of the 48 Preludes and Fugues made in 1952 and 1953 is a landmark release, particularly significant on the occasion of my 85th birthday, because the basic principles of my performance structuring and my historical studies are here established, fertilising all my continuing development." 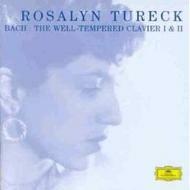 Tureck's influence on the interpretation of Bach's music is unparalleled. She has been called "Gould's only true model". Her Deutsche Grammophon recording of the Goldberg Variations was released to international critical acclaim earlier this year. According to the BBC Music Magazine, "Every note is played as if the culmination of a lifetime's consideration."